There are 5 signs your website needs a refresh. Keeping your website updated is vital as it is the shop window for your business. This is especially true if you do not have a physical premises your customers can visit. Which is why it is imperative that your website constantly evolving and growing. With the changes in technology, consumer behaviours and Google Algorithms your website needs to be reviewed on a regular basis and updated. Aside from updating your website with fresh content, there may be some strong indicators that your website is due for a makeover or at least a tweak here and there. Let’s take a look at five of the most common indicators that your website requires some attention. The older your website, generally the slower it will load. It will have been built using older software and practices which may now be outdated. This may cause your site to take forever and day to load. Ideally your website should load within 2 – 5 seconds. This is to avoid users leaving your site before it has loaded. While building the content on your website is great for SEO, it is still important to have a clear out and a declutter from time to time. Review the content of your website regularly. See if there is any content you could remove (or update) without affecting the history of your website or the SEO. Look for items such as landing pages for a competition or promotion which has long expired. The design of your website, and the design elements used to create it, could be having a huge impact on the time it takes your website to load. Using outdated graphical elements such as old fonts or the overuse of large images could be slowing your site down. Your website designer should be able to advise on best practices for updating the design or graphics used to improve your sites loading speed. Before the development and wide use of mobile technology, many websites were created to a fixed width layout. This means they had defined containers for the content to fit in. You may have seen this if you have visited a website on your mobile phone and had to scroll left and right to view all of the content. While this was fine a few years back, the rise in mobile technology has meant that web designers and developers now have to consider a range of screen sizes and positions i.e. mobile landscape, tablet portrait, making fixed width layout website design redundant. This is by far the most common reason why websites need a refresh. Mobile technology has literally changed the way we use the internet. Your website must keep up with these changes to stay in the game. In the early days of mobile it was common to have two versions of your website, a mobile one, which was usually a scaled down version of the full desktop version, and a full desktop version. Thanks to responsive design this is becoming a thing of the past. 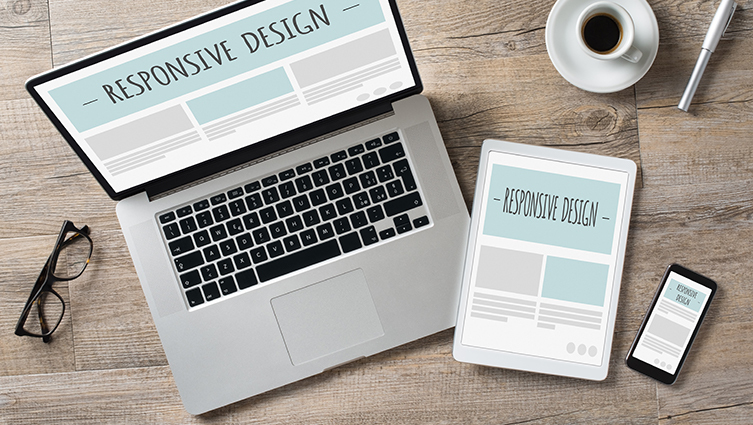 A mobile responsive website will ensure that your website displays consistently across multiple screen sizes and positions. An unresponsive website can be slower to load than a responsive website. It can also have a negative effect on site ranking. If you are concerned about your website’s load speed and think it may be time for a refresh get in touch. You can call us on 01527 517309 or email us via the contact form.